Lionel Messi: "Just yesterday I was watching the seven-year-old boys training beside us. They were being taught to play with the ball, to look after it, tactical things, how to understand the game." In youth soccer, say ages 6-9, it's usually the classic bumblebee type of formations that take shape during a game on Saturday mornings. Everyone rushes to the ball like bees and every now and then one player shoots out of the buzzing pack with the ball. Shortly after that though, the game turns into one big pack once again that moves up and down the field, the players all bunched up around the ball. On defense, a compact unit of buzzing bumblebees is good, but on offense the players need to spread out. Do the kids playing youth soccer know this distinction or really care? What's the purpose of soccer at this age? Is it to win? Is it to learn new skills? Is it to learn how to play as a team or with others? Is it just a chance for parents to have a bit of a break – babysitting masquerading as a soccer team? In general, at this age, games are usually seven versus seven or six versus six, on a small field with small goals and players rotate as goalies. This way everyone gets a chance to play and get involved in the game. But how much soccer knowledge or skill is actually gained. Many times it's two or three players who spend the most time with the ball while the others hover around the group. There's not much passing; there's not much teamwork at play; there’s not much soccer, really. To me, of course every youth soccer team isn’t going to act like Barcelona’s La Masia soccer school, but what it can do is focus a little less on wining and more on learning some soccer skills. Yes, everyone wants to win, everyone wants to score, that all unites the team. But maybe these leagues as a whole shouldn’t keep score, shouldn’t focus so much on wining…it’s a thought. Maybe the teams should focus more on passing and picking up some soccer skills. For example, the coaches or parents on the sideline like to tell the goalies or players to kick the ball down the field as far as they can. They don’t want their players to risk losing the ball in the back, near the goal. And while this is tactically a good point on a certain level, it’s just six and seven year olds playing soccer and why not let them learn how to play the game with the ball on the ground and pass around pressure. 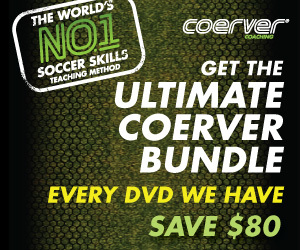 Why not learn how to play out of the back like Arsenal, Barcelona and Manchester United. Maybe this is asking too much. The idea though is to make young players not afraid of pressure. It's almost like they should envite it so they can pass through and around it. And then parents yell to the young kids that they shouldn’t play the ball into the middle, get the ball to the outside they yell. Yes, this too is another good tactical point: you don’t want to lose the ball in the middle of the field, where it’s crowded, and the other team will win the ball and go right at goal. But why not take those risks and figure out how to play the ball in and out of the middle. Learn how to pass the ball to someone under pressue and then get the ball back - a wall pass, a give and go, and overlap. What if the players simply learn how to pass the ball to one another? Is that too much to ask? Is it beyond the level of skill these players possess? Probably so, especially given the time many of these players practice together and then on their own. However, I think the idea of passing and spreading out and making runs off the ball should be taught, tried, and at least attempted. Kids learn fast and will pick up pretty much anything you spend the time teaching them. Kids are sponges for information and knowledge. You know when an exchange student comes over from France, Spain or Germany, and how they’re not really that skillful as a soccer player but they still know how to pass and move and spread out? Yeah, that’s what I’d like to see from young American soccer players. That and the skill on the ball. This is easier said than done. Perhaps it’s good enough that players shoot out of the bumblebee stack and dribble for a while and take a shot. Maybe that’s all you can ask for. Yet I think incorporating some ideas into the game, that sharing the ball is good, that shielding the ball is good, that playing give and goes are good, that playing the ball out of the back is good, that one and two touch soccer is good, are all things young players can learn and understand. Institute a series of steps each player should focus on when they’re playing in certain parts of the field: where to play the ball, what part of the foot to use, when in trouble how to shield the ball, when to dribble, when to pass, and so on. These aren't hard and fast rules, but tips and ideas. You don't want players to freeze and feel like they're making a mistake if they do something one way or the other. You don't want players thinking they have to play a certain way all the time. This goes to the idea of just letting the kids play. That they’ll learn from playing the game and trying things on their own. This too is true but why not give them an outline of out to play the right way – where the ball is meant to be kept in the still of Arsenal and Barcelona and not booted up the field in fear of losing it. Show the players that the ball is their friend and together, as a team, they can move it forward and score goals. Overall, at this age, you want them to learn how to go to the ball, how not to be afraid of the ball, how to strike the ball on goal, how to dribble, how to trap, how to pass, how to shield the ball, and just how to get comfortable using their feet on the soccer ball. At a very young age, it's only natural for kids to be a little bit afraid of the ball. Start out playing with smaller soccer balls or even a nerf soccer ball and then slowly progress to a large soccer ball. There's no need to force a little kid to kick a ball that's too big and too hard - pumped up too much. Still, it doesn’t hurt to show the players different concepts like making runs, spreading out, crossing, long passes, short passes, shielding, and so on. You’d be surprised what young players are able to pick up. "My way of playing has not changed much [since the youth team], although I have obviously learned many things about the game," he said. Just yesterday I was watching the seven-year-old boys training beside us. They were being taught to play with the ball, to look after it, tactical things, how to understand the game. They were playing just like us. It still surprises me." Let players try different positions: show them what to focus on when playing each position. Better yet, look at what each player does well and have them focus on improving that skill and expanding on it. If they’re good at striking the ball, see if they can play a long diagonal pass. 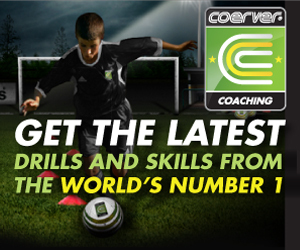 If they’re good at dribbling, see if they can work on their weaker foot or changing the pace of their dribble. If they’re good at tackling, see if they can win the ball and give it to an attacking player right away. The key is praising what the young player does well and then slowly adding in new skills. In the end, you hope that each player on the team will have a few skills they do really well, feel confident and comfortable using during the game, and then other skills they are adding to their game over the course of the season.